At evening tide her spirit sisters gather outside Leifeng Pagoda. and rejoin them in their endless dances. and reties the garment of time around her body. flying low over the West Lake reeds. the liquid ballet of the stem fish in the slow moving current. their voices joined in the water song. Madam White Snake closes her heart to her spirit sisters. in the multiple layers of this evening’s day. Madam White Snake has tasted the slow complex web of flesh. She will never let it go. 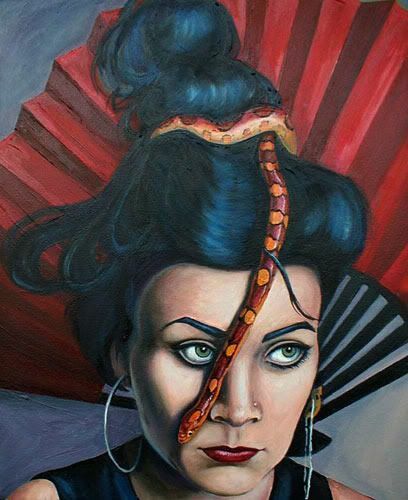 Image is Fan and Snake by Ella Guru. Deborah Walker loves dreamy, dark poetry. Her heroes are Christina Rossetti and Jacqueline West. Find Deborah’s poems in Scifaikuest, Apex Magazine, Dreams and Nightmares and Paper Crow. When I write poetry, I just unhinge my mind and let the ideas flow and blend. 'Blossom' came from three threads, the prompt from Megan, sitting in my garden and seeing the cherry tree in blossom, and a medieval ring I'd seen in the Victoria and Albert Museum. A lot of ideas for my fantasy poetry and stories come from museum objects. Haunting awesomeness -- that's Deborah Walker's work in a nutshell.